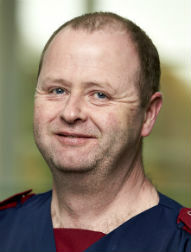 Colin Bergin is one of SRMRC’s Band 6 research nurses, with a background in critical care nursing. Having previously worked for Lloyds Bank for 14 years he completed his nurse training in 2004 and spent 12 months working on regular wards. In 2005 he began working in critical care, treating specialties as varied as liver and cardiac surgery, as well as trauma and burns. He has completed a degree course in critical care medicine for treating liver patients, and is now keen to use his experience within research to help patients of the future.